European Commission head Jean-Claude Juncker teased Hungarian Premier Viktor Orbán over his strongman reputation Friday, jokingly greeting him as “dictator” as he arrived at an EU summit in Riga. The right-wing Orbán has angered and infuriated his European Union peers for years, carrying out sweeping constitutional and institutional changes that critics say have curbed press freedom and judicial authority. “Hello, dictator,” Juncker was overheard to say to Orbán in front of the press at the EU-Eastern Partnership summit in Latvia. 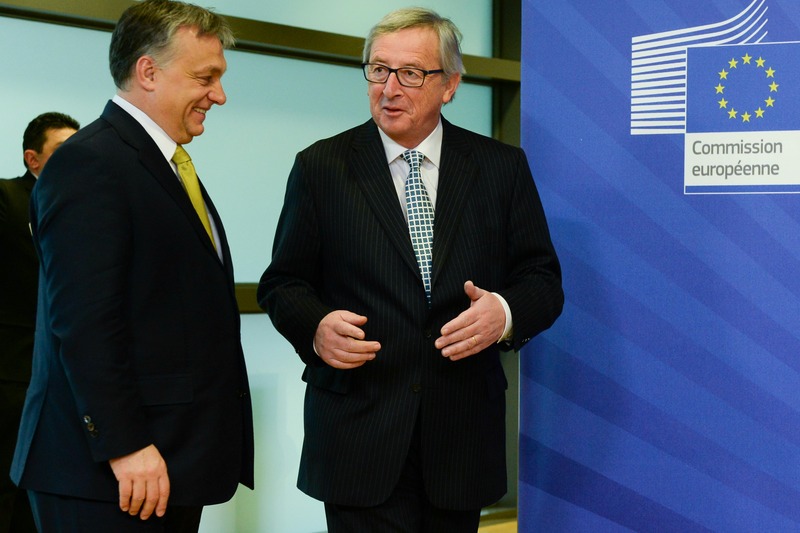 Reporters said they had not been able to hear what Orbán had said in reply, if anything, but Juncker was clearly in a playful mood as he received EU leaders alongside EU president Donald Tusk and Latvian Prime Minister Laimdota Straujuma. Juncker also chided Greek Prime Minister Alexis Tsipras for his dress sense, with the left-winger declining to wear a tie as usual. The dictator jibe from Juncker recalled a bitter row caused by US Republican Senator John McCain who labelled Orbán a “neofascist dictator” in December last year. Orbán called McCain’s remarks an “attack on national independence”. The Hungarian leader again angered EU lawmakers and officials this week by insisting that Budapest had the right to debate closing the door to migrants and reintroducing the death penalty. “Hungarians talk straight about tough things. We don’t like to beat about the bush. We are a frank people,” Orbán said on a visit to the European Parliament in Strasbourg on Tuesday. Officials in Juncker’s office said they had not heard what he had said to Orbán. The American Jean Claude Juncker is right in saying that ! Orban has ultimately show some ultimate behavior and incompatibility between its own people and E.U. Partners ! The case of the kettle calling the pot black. I do not understand why Mr. Junckers has to insult Mr. Orban, Mr. Orban himself said that he would not say “things” that were said about Hungary, to any other country… It is a matter of respect, let the Hungarian people judge Mr. Orban.